We are joining with the big The Broke and the Bookish crew and their Top Ten Tuesday this week. This week's topic? Top Ten Books of the Year So Far. The year is almost half over, and we have read so many great books already. My Lady Jane by Cynthia Hand, Brodi Ashton, and Jodi Meadows: This book is so much fun. YA is flooded with super serious books, and it was nice to read something so charmingly, self-consciously funny. Girl in the Blue Coat by Monica Hesse: I bought this book on a whim from Audible, and I ended up loving it. It's about a group of teenagers working for the resistance in Amsterdam during WWII. A Room with a View by E.M Forster: I've loved the movie for years but didn't read the book until recently. I found it just as charming. I love the fusty, early-20th-century British humor. Salt to the Sea by Ruta Sepetys: This book is powerful, beautifully written, and contains so much heart. It does what historical fiction must do it it's to be done well: it gives a face, a name, and real emotions to the individuals who experienced the events we read about in history books. Frannie and Tru by Karen Hattrup: With its gorgeous prose and tight framework, this book is the quiet kind of book that I love best. It handles big issues like racism, class, and sexuality on a personal level. The Secret to Letting Go by Katherine Fleet: A story about two teens who believe they are responsible for the deaths of people they love. This book is full of secrets and mysteries, and I loved watching them unfold. Goodbye Stranger by Rebecca Stead: The concept behind this book--can three friends survive middle school--is deceptively simple and doesn't begin to convey the depth of detail and heart within its pages. Orbiting Jupiter by Gary D. Schmidt: Beautiful, tender, heartbreaking. Gary Schmidt captures things so perfecting. Truly lovely. Fangirl by Rainbow Rowell: I'm a little late to the Fangirl party, but I have to admit, you guys were right. It's just really great in every way. 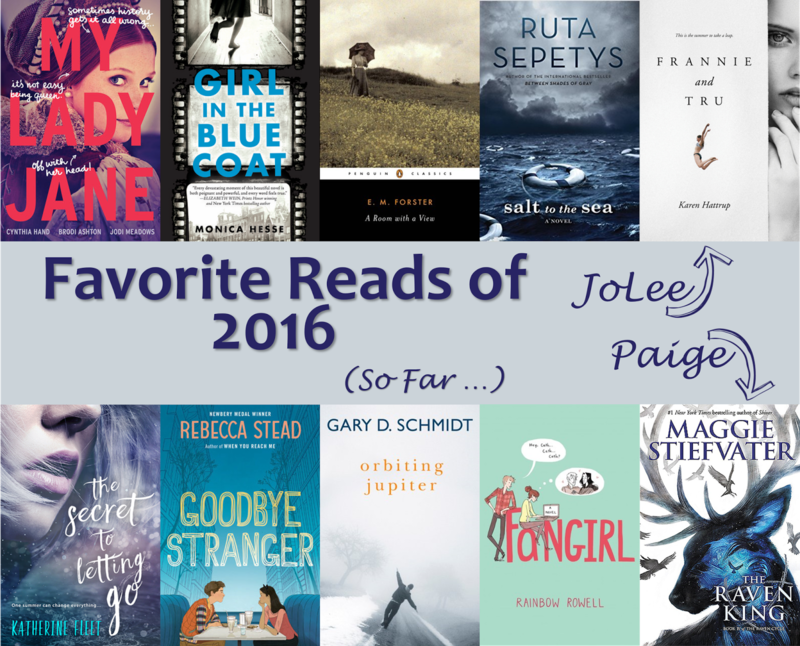 The Raven King by Maggie Stiefvater: Once again, I wrest a favorite away from JoLee. What a fabulous conclusion to one of our favorite series.